The mayors said more state investment is needed to spur the economy, create jobs and maintain the state’s crucial infrastructure. 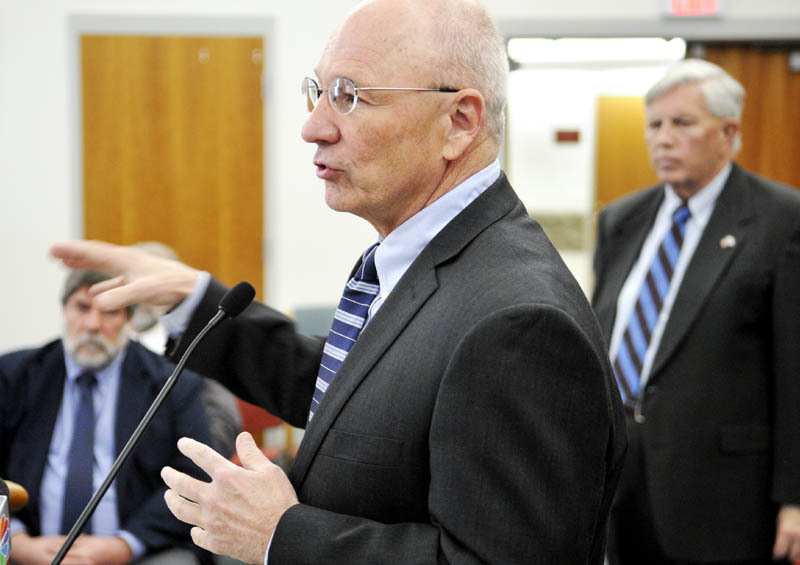 AUGUSTA — A coalition of Maine mayors on Monday proposed that the state government borrow $85 million to invest in education, job creation and road, rail and clean water infrastructure. The Mayors’ Coalition on Jobs and Economic Development, made up of the mayors from 12 service-center cities in Maine — including Augusta Mayor William Stokes, Waterville Mayor Karen Heck, Gardiner Mayor Thom Harnett and Portland Mayor Michael Brennan — released their proposal at Augusta City Center that the state borrow $85 million for economic development initiatives. They also lauded legislative efforts to keep state revenue sharing coming to cities and town, as Gov. Paul LePage’s proposed budget seeks to suspend such revenue. Portland Mayor Michael Brennan, center, discusses a $85 million bond package proposal for Maine cities, during a press conference called by the Mayors' Coalition on Jobs and Economic Development, in Augusta on Monday. At right is Bangor City Council Chair Nelson Durgin and, at left, Gardiner Mayor Thom Harnett. The mayors said their proposed state bond package, which is sponsored through legislation by state Sen. Roger Katz, R-Augusta, would help create needed jobs and job training, upgrade transportation infrastructure including roads and railroads, invest in research and development, and leverage federal funding to help prevent sewer overflows from wastewater treatment plants. Adrienne Bennett, spokeswoman for LePage, did not respond directly Monday to the mayors’ bond package, though she said the governor has proposed a $100 million transportation bond that would invest $81 million in roads and bridges statewide and provide $19 million for port, railroad, aviation and transit facilities and equipment. She said LePage recognizes the need for an economic plan for Maine “that is for the long haul,” and said he is committed to lowering energy costs and ensuring more Mainers are receiving the training and skills they need for today’s workforce. But Bennett said it has been four months since LePage presented his ideas on how to balance Maine’s finances and he has since heard nothing but complaints, not solutions, from Democrats. She said LePage’s experience as mayor of Waterville for eight years prior to becoming governor proved to him that local government has opportunities to reduce costs when efficiencies are sought. Nelson Durgin, mayor of Bangor, said coalition members met with LePage last week and talked about some of their plans. The coalition includes mayors from Auburn, Augusta, Bangor, Biddeford, Gardiner, Lewiston, Portland, Saco, Sanford, South Portland, Waterville and Westbrook. While disagreement about specific proposals remains, Durgin said he feels the mayors, Gov. LePage and the state Legislature are at least “on the same page” in believing that economic development is important for the state. Portland Mayor Michael Brennan said they met with LePage for about an hour and the governor didn’t commit to supporting their bills, but he didn’t say he wouldn’t. The mayors’ proposed bond would provide $20 million for economic growth in downtowns through the Communities for Maine’s Future program, which is open to all municipalities in the state. Stokes and Heck said Augusta’s and Waterville’s revitalized downtown efforts are examples of what can result when public and private dollars come together in economic development. The bond would also provide $15 million to train workers in the skills needed for in-demand jobs, and a $10 million investment in research and development-based industries, a measure which was passed by the Legislature in 2012 but vetoed by LePage. The coalition also expressed support for L.D. 1341, sponsored by Rep. Alan Casavant, mayor of Biddeford, which would create a program within the Department of Economic and Community Development for a state-municipal partnership to support projects that retain or expand jobs and train workers. Bennett cited Maine Department of Labor figures indicating private sector job growth in the last three years, resulting in an increase of about 6,000 jobs, as good news for Maine’s economy. 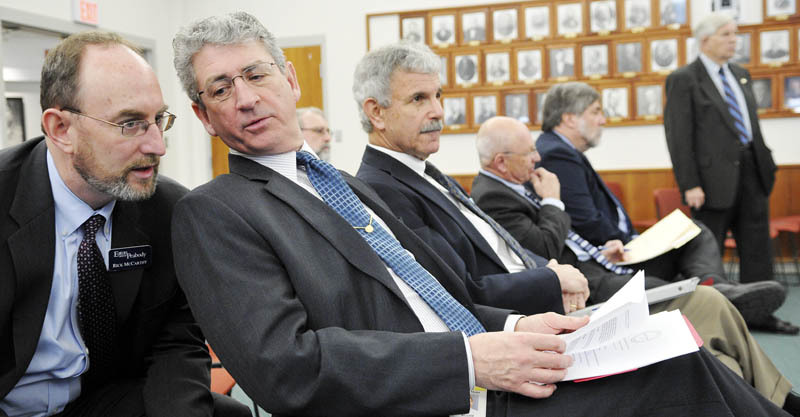 At Monday’s meeting of mayors, Harnett praised proposals from Katz and other legislators to restore state revenue sharing to municipalities, which would be eliminated by LePage’s proposed state budget. Harnett said losing revenue sharing would cost Gardiner, a city of about 6,000 people, $600,000 a year in revenue. It would shift a huge tax burden onto municipalities and property owners because municipalities will have to raise property taxes to make up for the loss, he said. Katz, a Republican and a former mayor of Augusta, is the sponsor of L.D. 713, a bill that would restore revenue sharing to municipalities to this year’s state budget. Over the next three years, the bill also would return the funding back to 5 percent of state tax revenue. Katz said the state has raided revenue sharing funds and reduced what goes to municipalities to 3.6 percent of state tax revenues.